BSA W10 review | What Hi-Fi? Brazil may not be the first place that springs to mind as a hotbed of home cinema excellence, yet it's the origin of the BSA W10, a substantial active subwoofer aimed at making an impact in the sub-£600 class. Given its exotic birthplace, first impressions of the W10 are rather prosaic. It's functionally finished and, with its grille removed, oddly proportioned. The large port on its front baffle is to blame: of course, it's there to help the 25cm drive unit deliver a more prodigious output, but it does nothing for the looks. Or, indeed, the sound quality. The BSA certainly goes loud enough: its 260W power amp gives it the heft to dig deep into Cloverfield's explosions, and it'll readily thunder out the laconic beats of Thievery Corporation's 2001: A Spliff Odyssey. However, even here the W10 always seems less precise than we'd like, and the moment you switch to any faster and more complex sounds, whether it's the repeated, shuddering impacts in The Dark Knight's chase sequence or The Prodigy's rage-infused beats on Invaders Must Die, it struggles badly. 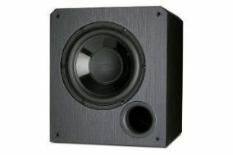 It's simply too undisciplined and slow, its port contributing to a sound that's far less precise and differentiated than that of the cheaper B&W ASW610. Given that it's also bigger, more expensive, and less attractive than the '610, it's hard to make a case for this BSA subwoofer.